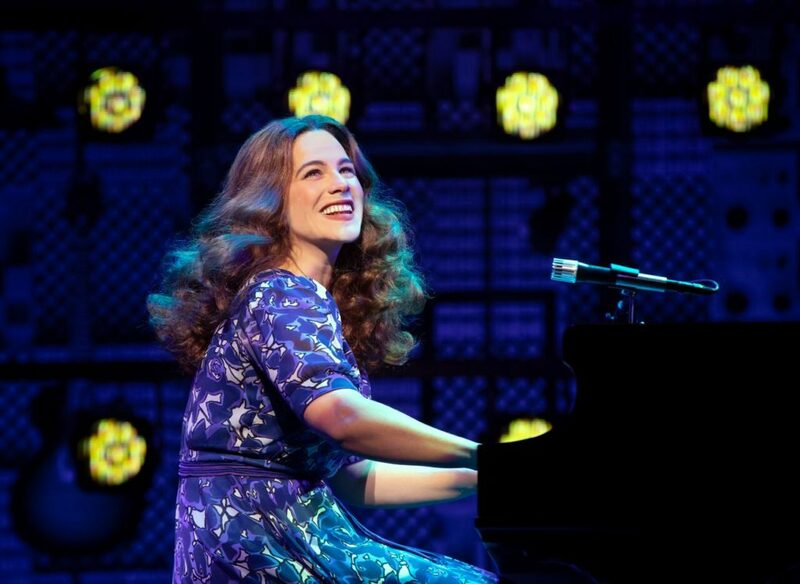 It’s as though the creators of Beautiful: The Carole King Musical, the touring production that opened last night at Washington’s National Theatre, didn’t exactly set out to celebrate one gifted songwriter along with two decades of American pop culture, the civil rights movement and women’s quest for meaning and equality. Surely, it all started with those songs, something like 400 of them, penned by a white Jewish girl from Brooklyn named Carole Klein, who decided early on she needed to be Carole King professionally, despite working for a man named Kirschner. To add another fascinating layer, those songs (with lyrics by the woman’s sensitive boyfriend-later-husband, Gerry Goffin) nearly always found their way to African-American artists, who besides cutting lots of hit records were making new headway with a new “white” medium, television. The songs, yes. Boy, did the creators have some great songs. Yet they also had the makings of an engaging story, a hero’s journey every bit as much as a songbook. That talented young woman, starting out with a husband, a home (in the suburbs, no less) and children, and far too shy to warble her music beyond what it took to sell it, found not only a deeper life after divorce but, in the most literal sense possible, discovered her own unique and beautiful voice. Since this music would be the draw, book writer Douglas McGrath’s main job was giving it a track to run on, which he does in Beautiful with style, understanding and no small amount of grace. 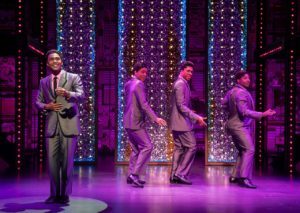 In most of the evening’s first act and even some of the second, this takes the form of melodies joining lyrics at a simple piano and then appearing, with much glitz and glitter, sung on TV by the Drifters, the Shirelles and other African-American acts of the day. With this “hit parade” format, most of the earliest King-Goffin compositions are presented as we might remember them from AM radio, bluesy-smooth and choreographed for the TV cameras down to the fingernails. Highlights of this collection include “Up on the Roof” by The Drifters, “Will You Still Love Me” by The Shirelles and the ever-infectious “Locomotion” by Little Eva (when Eva found a singing career, King and Goffin lost their regular babysitter). As the story moves on, however, Carole’s solo songs in particular get more theatrical settings, such as “You’ve Got a Friend” touchingly envisioned as a farewell among friends and “Natural Woman” sung in the recording studio only reluctantly because it reminded Carole of the now-departed Gerry. In structure, Beautiful is a tale of two couples – King and Goffin, of course, along with Cynthia Weil and Barry Mann. Weil and Mann are not only the couple’s best friends but also passionate competitors. The fact that their hit songs “sound different” provides the show with musical diversity as well as drama, and lots of jokes about record sales as reported in Billboard magazine. The two couples work in next-door offices in the same building for the same publisher, making their scenes together even more numerous and entertaining. Sarah Bockel, performing here with verve, growing confidence and the songwriter’s quirky but authentic singing voice, is a perfect Carole King, early Brooklyn accent and all. Dylan S. Wallach gives us a believable, sympathetic-enough Goffin, even as his extramarital affairs and worsening mental troubles drag the marriage and the partnership to an agonizing halt. Alison Whitehurst and Jacob Heimer are utterly convincing as Weil and Mann. Mann’s whiny “New York Jewish” hypochondria, seldom without a long list of doctor’s appointments, serves up one of the show’s happiest running gags. And Weil’s reluctance to marry her songwriting partner sits comfortably within a story in which both women make romantic choices based on childhood experiences of absent, faithless fathers. This “movie” might be called Freud Lite, with a terrific soundtrack. Perhaps what really matters here is Carole’s hair. No, really. She is only 16 when we meet her, wearing a modest school-girl ponytail, and through most of her married life she wears her hair short, straight and close. As most of us know, however, by the time Carole Klein is ready to actually BE Carole King, her hair is everywhere, twisting and turning, curling and bouncing, down over her shoulders as her hands attack the piano keys and her lips lean ever forward toward the microphone. The title song is performed as a final solo concert at Carnegie Hall, and by then its refrain is a virtual mantra for a Broadway musical and indeed a significant life: “You’ve got to get up every morning, with a smile on your face, and show the world – all the love in heart.” No one who has known only happiness could proclaim, or even think of, such a message. This is the Carole of the iconic 1971 album Tapestry. This is the Carole audience members at the National Theatre – especially the women in the audience, who’ve lived most chapters of the same story – adore and embrace. Beautiful is a wonderful way for that Carole to adore and embrace all who admire her right back.